Hazare began his fast demanding appointment of Lokpal at the Centre and Lokayuktas in states where such statutory anti-corruption watchdogs do not exist. 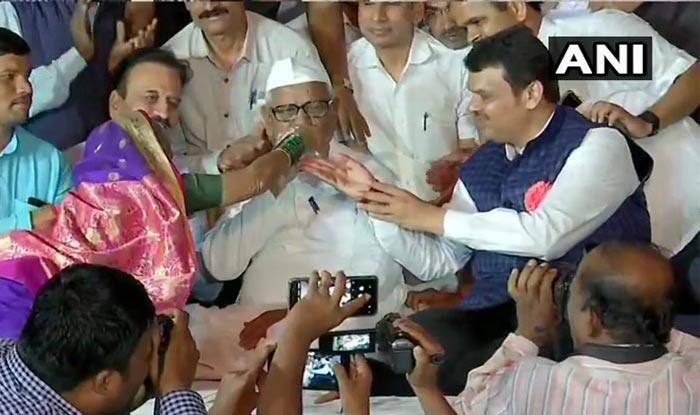 Mumbai: Social activist Anna Hazare on Tuesday called off his hunger strike over the appointment of Lokpal and passage of the Lokayukta Act in Maharashtra following a marathon meeting with Maharashtra Chief Minister Devendra Fadnavis and two Union ministers. Hazare, 81, had started his indefinite fast on January 30 over “non-fulfilment” of assurances by the Centre and the Maharashtra government on the appointment of Lokpal and passage of the Lokayukta Act in the state. “I have decided to call off my fast after satisfactory talks with Fadnavis and the other ministers,” Hazare told reporters. Fadnavis, who reached Hazare’s native Ralegan Siddhi village in Ahmednagar district in the afternoon and held prolonged talks with him, said the government has accepted the activist’s demands. The process of appointing Lokpal will be initiated soon, Fadnavis said. Union ministers Radha Mohan Singh and Subhash Bhamre and Maharashtra minister Girish Mahajan were also present during talks with Hazare. Hazare began his fast demanding appointment of Lokpal at the Centre and Lokayuktas in states where such statutory anti-corruption watchdogs do not exist, and resolution of farmers’ issues. He has also been demanding implementation of the Swaminathan Commission recommendations on ways to address agrarian distress, besides electoral reforms. Locals who observed a bandh recently to show support for Hazare’s agitation, restricted entry of government officials to the village on Tuesday. Hazare had Monday claimed that senior BJP leaders who once vehemently backed his Lokpal demand had turned ‘allergic’ to it after coming to power and accused the ruling dispensation of betraying people who voted it to power in 2014. “During my Ramlila Maidan agitation on Lokpal and Lokayukta, the entire country stood up. An atmosphere was created. That is the reason why you (BJP) came to power. Now you are betraying the people who brought you to power,” Hazare had said. “Leaders like Arun Jaitley and Sushma Swaraj had once vehemently defended the Lokpal demand in Parliament. But after coming to power, they are mum over it. It looks like they are allergic to Lokpal and Lokayukta. The agitation brought them to power but they have forgotten it,” Hazare had said. MNS chief Raj Thackeray and water conservationist Rajendra Singh met Hazare on Monday and extended their support to his agitation. Thackeray asked him not to sacrifice his life for the “useless” government.